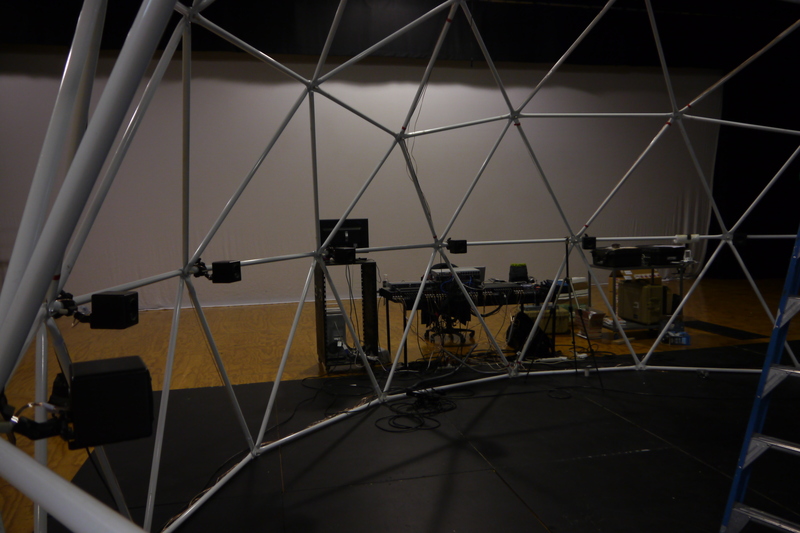 The physical structure of the SoundLabyrinth comprises a 6.5m diameter, three frequency geodesic dome frame with a translucent white material cover. Within this frame, a 24.2 channel sound system is installed, along with 4 channel video projection. The 24.2 channel system consists of 24 matched mid-range Grover Notting CR-1 reference monitors and 2 powered subwoofers. The 24 mid-range speakers are laid out in three levels: 12 speakers in the bottom layer evenly distributed around the circumference of the dome (approx 1m from the ground), 10 speakers in the mid layer, appox 2.5m from the ground, and 2 speakers directly overhead approximately 0.5m either side of the centre of the top of the dome. The crossover between the mid-range and sub- woofers is at 100Hz, making the low frequency speakers slightly localisable. Hence two subwoofers are used, and are distributed on either side of the dome so as to not disrupt the overall sound image. Spatialisation of the audio content is controlled via Max/MSP, using the ICST ambisonic externals.